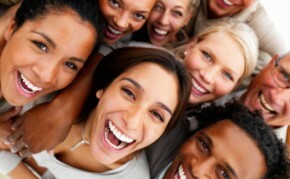 5 Great Reasons to Smile and Laugh More; Get Your Smile on! Your dentist can give you lots of reasons to smile and laugh more. When they take care of your teeth, you’ll leave every visit with a brighter, whiter smile. You’ll feel more confident and that—along with the following 5 benefits of smiling—will make you a happier person with a greater quality of life. Consider these 5 reasons to turn that frown upside down today. There are certain foods you can eat that’ll strengthen teeth and make them look brighter and whiter. Just as milk with all its calcium will do your body good, so will smiling. When you smile and laugh, you’ll work your abdominal muscles and release endorphins to alleviate pain and boost the immune system. You may be a kind and generous person, but nobody will know if you’re looking sour all the time. When you turn the corners of your mouth up, you’ll look like a more approachable person. People want to be friends and hang around people who are happy. Have you ever wondered why going to a funny movie seems to have a way of making all your problems disappear? Studies show that laughing and smiling relieves stress and triggers your brain to feel happier. The price of happiness may be equal to the price of a movie ticket. Did you know that when you’re able to smile and laugh through work you’ll be more productive? If you’re working with people you like and have conversations with while you’ve got your nose to the grindstone, you’ll enjoy yourself more and even get more work done. There are a lot of reasons to laugh and smile more, but perhaps the most important reason of all is that it will make you feel good too. Seeing Dr. Turner in Aliso Viejo will make you feel and look a lot better. Talk to the team at Turner Dental Care about how you can smile and laugh more while taking care of your teeth. Dr. Turner specializes in helping you get The Smile You Have Always Wanted. Call for a free consultation to see how we can get you smiling at (949) 770-3294 or book one online.